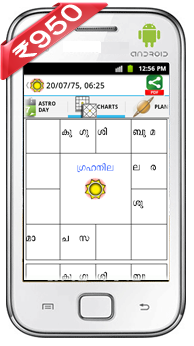 This mobile phone based astrology software can be installed in any mobile phone or tablet with SIM slot (with IMEI) having the Android 2.2 or later platform. The software is in Malayalam, Tamil, Hindi, Kannada, Telugu and English language. The downloaded version can be use to generate horoscope of the dates between 01/01/2016 to 31/12/2016. To lift the date limitation you have to register and activate the product. Latest version is available in Google Play Store. Please download the letest version directly to your mobile from Google Play Store . 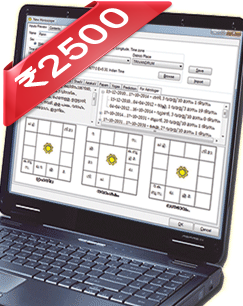 This Indian Vedic Astrology software is available in six languages (English, Malayalam, Hindi, Tamil, Kannada and Telugu). With an enhanced look and feel that makes it even easier than PROPHET2006 to use. The downloaded version can be use to generate Horoscope and Marriage compatibility reports of the birth times between 01/01/2010 to 31/12/2015. Extract this compressed ZIP file and open the ‘SETUP.EXE’ to download and install the needed components (Microsoft SQL Express and Crystal Reports runtime) required to run PROPHET2015. An Internet connection is required during the installation. The software is in Malayalam Tamil, Hindi, Kannada, Telugu and English language. PROPHET2015 Trail. Extract this compressed ZIP file and open the ‘SETUP.EXE’ to download and install the needed components (Microsoft SQL Express and Crystal Reports runtime) required to run PROPHET2015. An Internet connection is required during the installation. The predecessor of Prophet2012, Prophet2006 doesn’t need any other software component other than this download. The Evaluation copy can be use to generate astrological details between 2005AD to 2010AD. The software is in Malayalam Tamil, Hindi, Kannada, Telugu and English language. The software can be download and install in Java supported mobile phones. The downloaded version can be use to generate horoscope of the dates between 01/01/2012 to 31/12/2012. To lift the date limitation you have to register and activate the product. Installation : Download the compressed ZIP file ProphetMobileJava2012.zip (Latest update on 16-02-2012) or ProphetMobileJava2011.zip (Latest update 18-Sep-2011)into your computer. Extract both Prophet2?? ?.JAD and Prophet2?? ?.JAR from the it and copy the files to your mobile. Open the file from your mobile with the help of the file manger of your mobile phone and your mobile will install the software in your mobile phone itself. The software is in Malayalam Tamil, Hindi, Kannada, Telugu and English language. Or, you may download mobile astrology software for each language separately from the following links. The software can be download and install in MS Windows 6/6.1/6.5 OS based mobile phones. Prophet2010Me needs SQL server compact 3.5 core also to manage the astrology databases. So, you have to download and install the run time of SQL Server compact 3.5. also. The downloaded version can be use to generate horoscope of the dates between 01/01/2008 to 31/12/2009. To lift the date limitation you have to register and activate the product by sending your mobile ID by SMS or email to Supersoft. The date limit of registered and activated version is between 01/01/1800 to 31/12/9999. Installation : Download the files Prophet2010Me.CAB and sqlce.ppc.wce5.armv4i.CAB into your computer. Copy the downloaded files from your computer to mobile. Open the file from your mobile. Your mobile will insatll the software and the icon Prophet2010Me will be in the [programs] list. The software is in Malayalam Tamil, Hindi, Kannada, Telugu and English language. Unicode Malayalam Keyboard driver and fonts for MS Office Word, Excel, Power Point, Access.. etc.. Orkut, Blogs, Wikipedia... etc... on Windows XP/ Vista/ Windows 7. Non-Unicode Indian language Keyboard driver and Font pack to type Malayalam, Hindi and Tamil - in almost all software under MS Windows platform, such as MS Office, Adobe PageMaker, PhotoShop, CorelDraw .....etc.... on Windows XP/ Vista/ Windows 7. Remington (Typewriter) and Inscript (DOE) Keyboard Layout. Supports Malayalam fonts of "Thoolika " and C-DAC ISM, iLeep. Malayalam Software development kit Contains two ActiveX controls and 14 different Malayalam fonts for developing bilingual (English/Malayalam) database applications with the help of development tools such as Microsoft Visual Studio. Bilingual (Malayalam/ English) Wordprocessor software under MS DOS Release in 1991, during the era of MS DOS operating system. The amazing thing about this software is, only a 4MHz, 8086CPU based computer is enough for Malayalam Word-processing !!!. The download contains the application and its source code in Borland C.
Six language fonts (Malayalam, English, Tamil, Kannada, Telugu and Hindi) of the astrology software PROPHET in compressed zip format. These fonts are useful for viewing the reports generated by Supersoft PROPHET astrology software. Opentype Malayalam Unicode font for traditional Malayalam script as per the specifications of Unicode version 5.1. The font was released on 2002 October 28 and it's the first Malayalam Unicode font for traditional Malayalam script. True Type Font (TTF) non-Unicode Malayalam ASCII Font. Many leading publishing houses are using this font since 1994, the most popular among them is KERALAKAUMUDI daily.